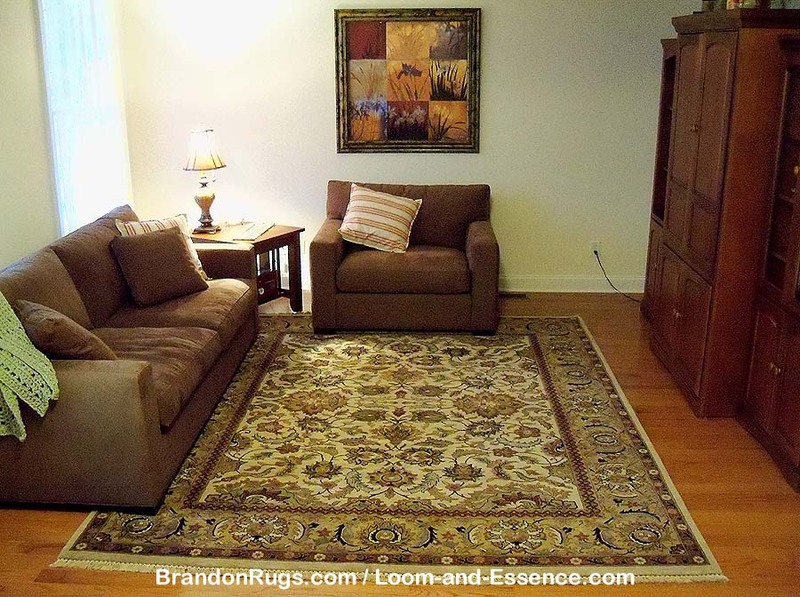 The URL above is to our Pinterest Page where images we have shared elsewhere on our website (BrandonRugs.com), Picasa, or this Blog now appear also. Respecting contractual agreements we have with our many suppliers, and copyright law, we do not as a rule permit photography of any rugs in our store without prior request and grant of permission. 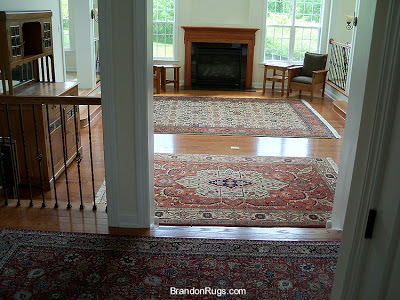 This was taken on moving day at our customer's new home, so the rest of the Great Room furniture has not yet arrived. It demonstrates, however, the successful use of different rugs in close proximity to each other to define separate areas of use in a room, and maintain the sense of visual and functional integrity for the entire space. 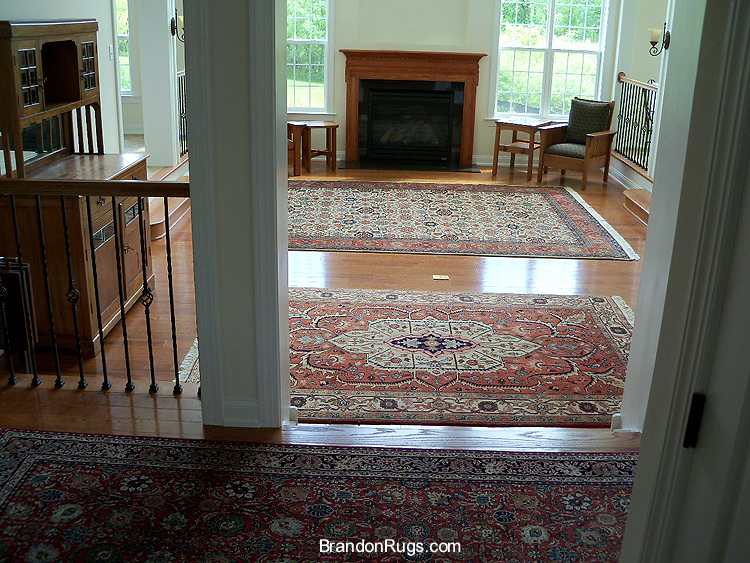 What is not shown here are the additional rugs (behind and to the right of the camera in the dining room and entry hall) which also add to the elegance and visual flow from room to room. 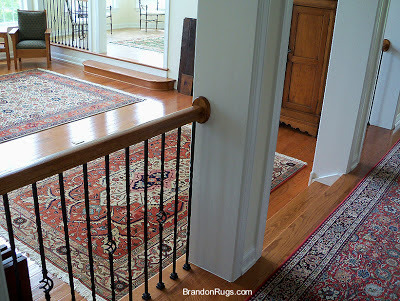 The viewer should appreciate what the area rugs do for the room versus what bare floors, bound carpet, or wall-to-wall carpeting would offer instead. You can see how the oriental rugs, as unique as they are individually, actually make the room more intimate and visually whole (like a well composed picture.) 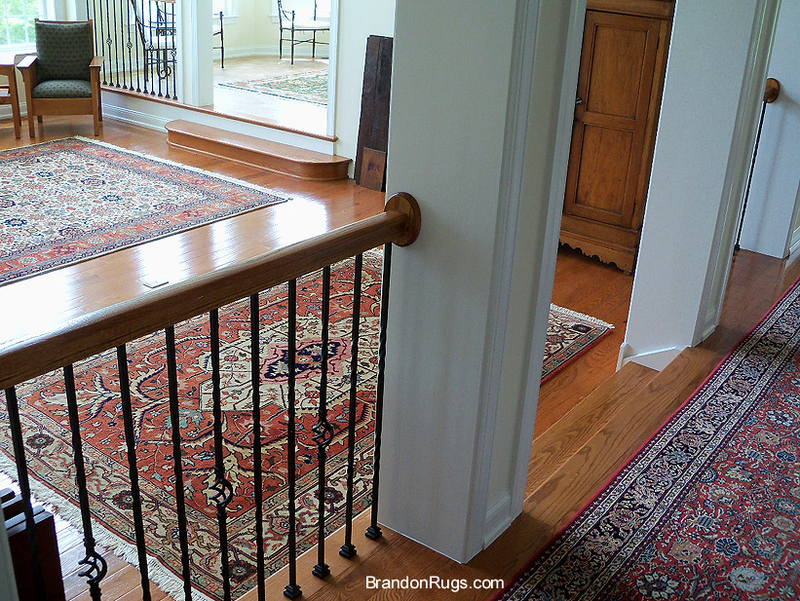 Bare floors or an expanse of carpet could NOT accomplish what these fine quality, handmade (and uniquely individual) oriental rugs do in concert. This small room at the entry of this newly finished home functions as a second living room/reading room/ media room. In an open floor plan (not apparent in this picture) it is adjacent to a central hall and opposite a formally furnished dining room. Our customers had a very good idea of what they were looking for and needed to complete the room. They saw -- as can you -- that a rug brings necessary intimacy, warmth and comfort to the room so it can be used as intended for the functions listed above. The rug they selected integrates all of the existing room furnishings, and focuses them along the long axis centered on the painting and the oversize chair beneath it. The rug's light background maintains a feeling of openness in the small room, while the neutral palette of the contrasting border serves to unite the seating and define the limits of the room. Without being too emphatic, the rug makes the simple declarative statement that this room is now complete, and an inviting space to gather as a family and relax. Great things happening in what promises to be a wonderful New Year. We have numerous well-stocked sources for REAL Persian rugs (all types, sizes, ages); and look forward to being able to offer these treasures to our clients at very attractive price points (considering the upward price pressures caused by the current embargo on trade with Iran). With the interior design trend swinging again toward vivid color and well-defined pattern -- as well as a revived appreciation for enduring quality and value -- Persian rugs as a class are the perfect answer to evolving style demands. May your New Year be filled with good things. And in the fortunate days ahead, we invite you to consider REAL handmade rugs from Brandon Oriental Rugs/ Loom And Essence as one important way to fulfill your wishes for good things.